(c) Bayerische Vermessungsverwaltung From Autobahn 8 Holzkirchen passing by lake Tegernsee, it was about 100km to Christrum ski area at Achenkirch, shortly before lake Achensee. 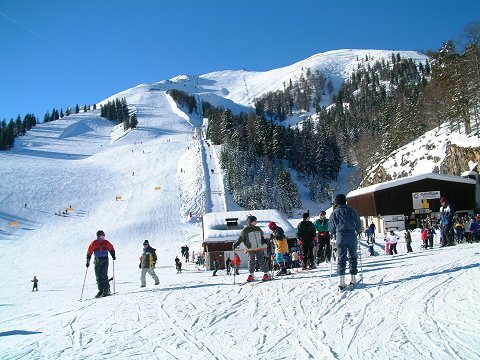 Tageskarte (One day ski pass) costed 26 EUR, the first thing paid for in EUR!. At that time restaurant had to accept Austrian Schilling, EUR and just DM as normal border ski area. It was really confusing. Such a small ski area with only three lifts and some T-bars is good for practicing. From the top of the last lift, surrounding mountains in the north direction looked very nice. 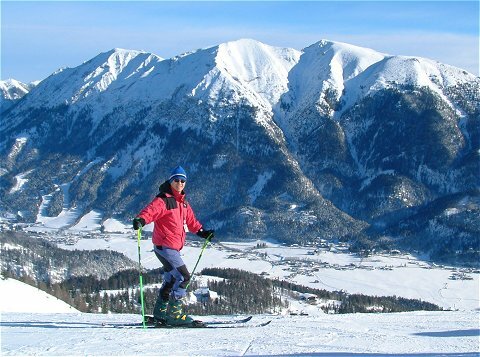 Especially Juifen is a mountain for tour skiing or mountain bike. Here you see mountains named "Unnutz"="not applicable? "on the back ground.